THPBlog: Fruit Growers Supply Company to clearcut and shelterwood log between Grass Lake and Highway 97. Fruit Growers Supply Company to clearcut and shelterwood log between Grass Lake and Highway 97. THP 2-13-076 SIS (Hamilton Flat THP) Fruit Growers Supply Company, 619 acres; 70% shelterwood, 30% clearcut logging. First Creek, Smith Spring, Prather Ranch, Upper Horsethief Creek (MD: T45N R2W Sec.18; T45N R3W Sec.1, 12, 13, 23, 24, 25, 26). Winter operations, low erosion hazard, slopes up to 30%, herbicides, impaired 303.d watershed, 1 spotted owl within 1.5 mi, 2 goshawk territories within .25 mi, Sandhill crane sightings within .25 mi, scattered large trees. Estimated public comment deadline: 11/28/13. 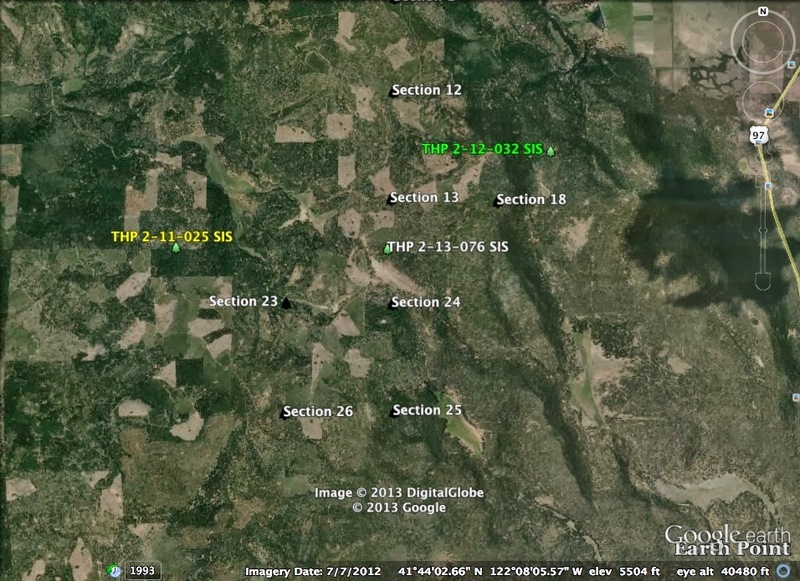 This THP is about 9.5 miles SW of Macdoel, CA near the Butte Valley which is close to the CA/OR border. Fruit Growers Supply Company is planning a mostly clearcut tractor based logging operation in white fir, ponderosa pine, Douglas fir, sugar pine and incense cedar forest at an elevation of 5,400 to 6,200 feet. Fruit Growers Supply Company is claiming the need to clearcut, and log out the over story (shelterwood removal) due to slow growing stand conditions, declining white fir and the presence of mistletoe - such conditions are natural and not abnormal at higher elevations. This THP is also close to FGS (Vista THP 2-11-025 SIS) and FGS (Prather THP 2-12-032 SIS) that recently clearcut and shelterwood logged over 586 acres combined. There are 3 goshawk territories nearby; 2 goshawk territories are within .25 mi of harvest units, and Greater sandhill cranes have been spotted at First Creek meadow .25 mi from the THP area. Swainson’s hawks which migrate from South America are uncommon in California, but have been also been seen nearby. A large elk herd moves through the area, and “Journey,” the gray wolf (OR7) traveled through or near the project area during the winter of 2012. More information is available on the THP Tracking Center website.